Sunday evening’s fixture between Lazio and AC Milan in the capital promises to be a thrilling showdown worthy of attention from supporters of the two clubs and neutrals alike. The sides are united in their aim of securing a place in next season’s Champions League come the end of the campaign, and are separated by just one point after the opening 12 rounds of Serie A. Simone Inzaghi’s Lazio sit in fourth place by a whisker, while their Milanese rivals are just outside those coveted qualifying spots in fifth. A win would see the Rossoneri leapfrog Sunday’s opponents, yet they have a real mountain to climb as boss Gennaro Gattuso has seen his squad decimated by injury. All three first choice centre backs – Captain Alessio Romagnoli, Mateo Musacchio and Mattia Caldara – have been ruled out for this clash, leaving the Coach no option but to field fourth-choice Cristian Zapata, with reports suggesting midfielder Franck Kessie will have to join him in the backline. Ivan Strinic is also still missing at left-back, while midfielder Lucas Biglia is currently on the treatment table, and Giacomo Bonaventura has now been ruled out for the season. Further forward, Milan are missing winger Hakan Calhanoglu and striker Gonzalo Higuain will sit out the match after receiving a red card for an incredible show of indiscipline versus former club Juventus. Milan have won three of their last six encounters versus their Laziali opponents, however a look at the last league fixture played at Stadio Olimpico saw the home side register a 4-1 win. Inzaghi’s men will be buoyed by a 2-0 win over Parma and an impressive 3-1 victory over Olympique Marseille in Europe before the international break. As much as Gattuso will try to overcome the adversity caused by his injury list, the task ahead of him should prove to be insurmountable this weekend. Coral offer 5/6 on a home win in this fixture, a bet well worth considering given Milan’s crisis. One pattern that has been very well established with Milan this season is a tendency to both score and concede in each match. A 1-0 win over Udinese on November 4th was incredibly their first clean sheet of the campaign, while Gattuso’s side have also only failed to find the back of the net themselves versus Juventus and cross-city rivals Inter this term. With this in mind, an offer from FansBet of 5/7 on both teams to score is a good route to making money this weekend, and the same site also offer a combined bet of 21/10 on a Lazio win with both teams on the scoresheet. 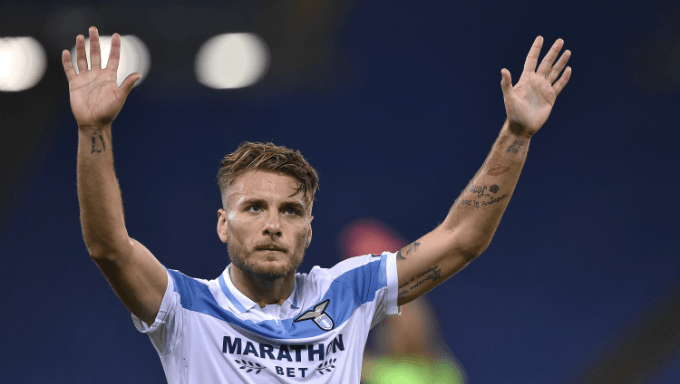 Milan’s defensive woes will be music to the ears of Lazio striker Ciro Immobile. This month has seen the Italian international fire in twice versus SPAL and provide two assists versus Marseille, and he will be looking to exploit any potential weakness in the Rossoneri backline on Sunday. The striker has faced criticism for his performances for Italy in the international break, yet his domestic form is never really up for debate as he finished joint-top scorer with Mauro Icardi last season, and has fired in eight goals in 11 starts already this term. 888Sport offer 3/1 on Immobile to score either first or last, while FansBet show 20/27 for the 28-year-old to fire in anytime. A look at the 888sport Wincast reveals a great offer of 9/5 for a Lazio win and an Immobile goal, a superb way of combining tips to ensure better odds on this occasion.